These days I think that wedding receptions get far more attention than the ceremony itself. 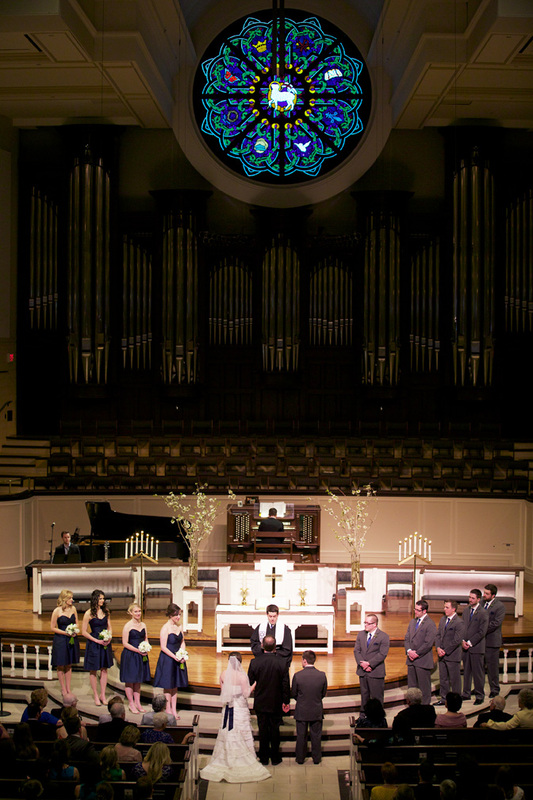 But my new husband and I are both very active in our church and faith is really at the center of our relationship, so we really wanted the ceremony to take center stage on our ‘big day’. My husband and I met because my twin brother who is a United Methodist preacher set us up. Reese grew up in the church my brother had been appointed to serve. It also happens that this church has a STUNNING traditional sanctuary that I swear was designed to look good for weddings. So our ceremony venue was an easy choice. 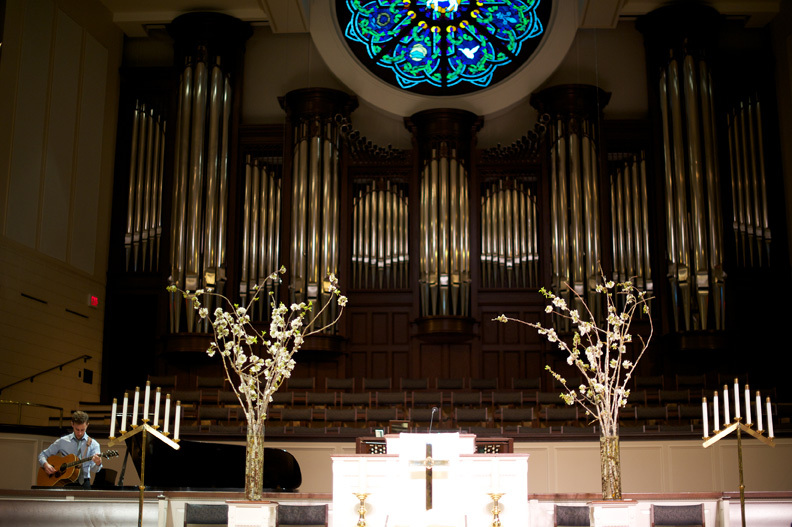 You’ll get to see some of their masterpieces at the reception in my blog post tomorrow, but I couldn’t have been more pleased with their idea for our two sanctuary arrangements. See the guy in that picture above? His name is Micah and he is a fantastic musician who plays at our contemporary worship service and someone who has become a good friend of my husband and I. (ps he and his wife got married the weekend before we did!) He played two songs at our wedding, both traditional hymns but played at a faster pace because slow songs make me want to scream. We picked Be Thou My Vision and How Great Thou Art; both of those songs remind me of my childhood growing up in smaller churches with very traditional worship services. And we decided to have How Great Thou Art as a congregational hymn because I think there is something very powerful about having all the people in your life who love you joining in your ceremony. 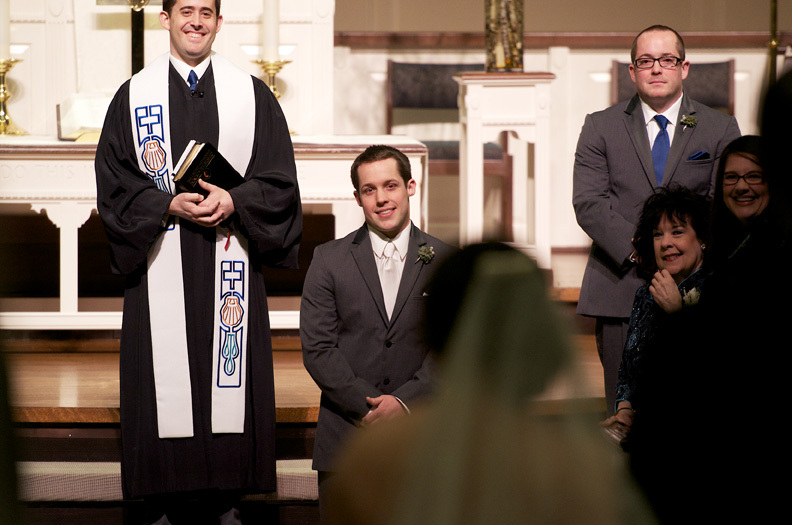 I’m kind of jumping backwards in the ceremony, but one of the coolest feelings for me was walking down the aisle. I thought I had my emotions pretty much in check, and was feeling very in control and then I realized that I knew all of these people (well, almost all). It was very overwhelming to think about the different phases of my life and the people who represented those all in this one place at this one time. And there at the end of the aisle was my sweet groom waiting for me. And since we are moving backward through the ceremony, here is a wonderful shot right before the wedding ceremony (and proof positive that you should pick an EXCELLENT wedding photographer). Our photographer had me kiss my dad’s cheek right before we went in the doors. It is such a sweet picture and an excellent reminder of how much I love my dad. Our photographer was fantastic. If you are in Dallas and need a photographer, I highly recommend Lauren Guy. 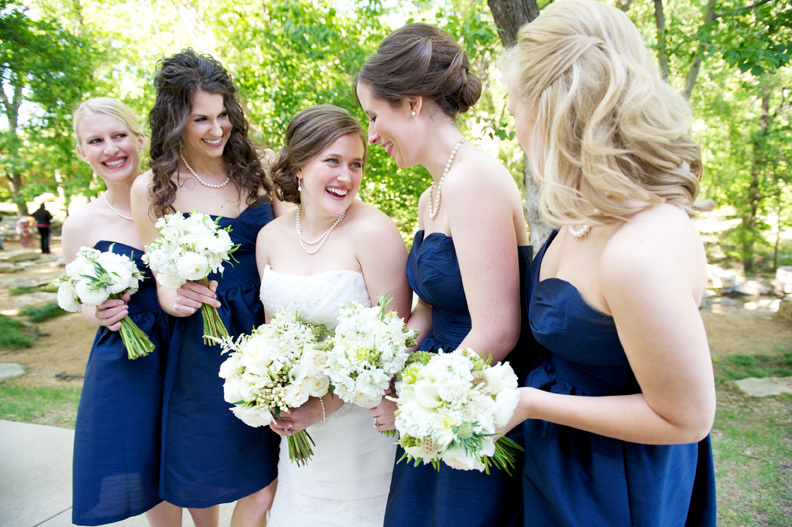 The below picture of my bridesmaids and I is another excellent example of how great a photographer she is: In case you are wondering the dresses are Alfred Sung in Midnight Dupioni, they turned out beautifully (and they have pockets!!)! I love the way navy and white look together!! And one last picture from the ceremony part of the day and its one of my favorites. 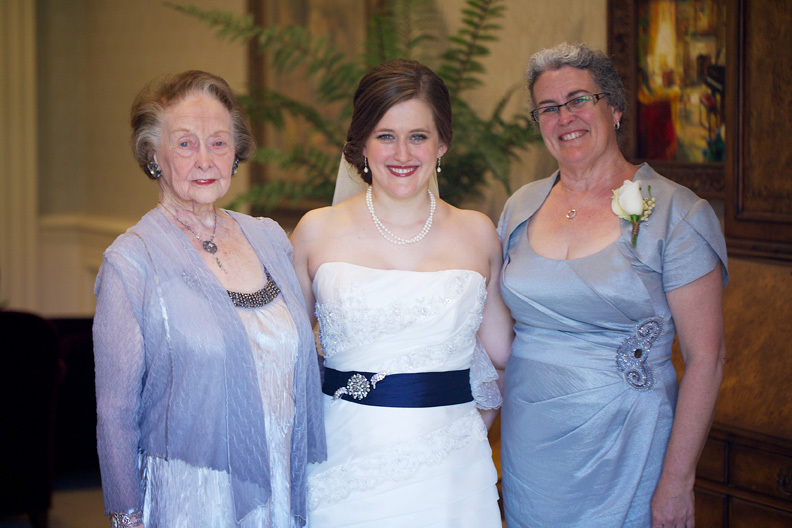 This picture turned out beautifully of our three generations. How beautiful are my mom and grandmother? I am so very lucky to have so many wonderful female influences in my life and if I turn out half as good as either of them, I’ll consider myself a success. Plus between the two of them, they have had 90+ years of marriage!